In any case, still here. Looking forward to being a bit more “back in touch” by late spring / summer! Meanwhile, all best, to all of you. Oh wow. Yes, it does appear to be true that I missed the entire month of May, in terms of blog posts. Oops. If you’re actually reading this … hugs, love you lots! Grin. As I often mention in my emailed newsletters or announcements, I tend to be a lot better about 1:1 comms than blog updates. Please don’t hesitate to contact me any time. And / or, sign up for the news, and you’ll get “the latest” delivered to your inbox. 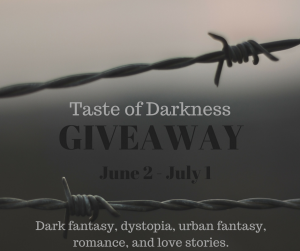 And now I’ll leave you with this lovely “Taste of Darkness” event, going on the entire month of June! No, really, I DO stop by my own website every so often. I know it’s not always easy to tell. Good thing there are so many other awesome blogs out there in the world to read, in between my super-infrequent posts. For what it’s worth, most people can vouch that I’m way better about one-to-one communications than blogging. Please don’t hesitate to reach out via one of the social channels or via email, any time. Back to fiction generation, now. The “joke” has been going around on social media that we never knew all those dystopian fiction novels we’ve read, might actually be how-to guides. 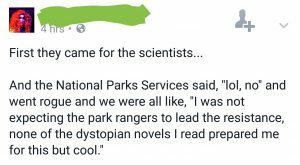 Another joke, one that I rather like, is the one where people marvel at how none of the post apocalyptic or dystopian novels they’ve read prepared them for the day when the National Park Service became the leaders of the resistance. Those who tune in here know that I’m a both an infrequent and a minimalist blogger, these days. (Wasn’t always so, but, my prolific online sharing days are a few years behind me.) Sorry for the shock setting in already, no doubt, that within this sentence I’ve passed the 100 word mark, and I’m not yet signing off. Heh. There is much to be said — much that has been said and is being said — about the role and service of dystopian fiction. I won’t be doing a re-do of all that here, albeit, I do encourage you to explore and learn on the subject on your own! In the AMERICUS series, I imagine a world set in a future continental North America where a precipitating event that happened a little over a hundred years back, caused a great deal of damage all over the world. It also caused the fracturing of the “old United States” into separate countries organized along ideological lines, as well as geographic area. This fracturing did not happen out of nowhere. It happened based on existing divisions. Namely, the kinds of divisions we’re seeing right now in the real and current United States. 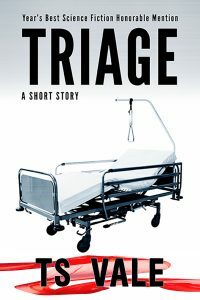 So what does one do, when one realizes that the future dystopia and alternate America one has invented within the realm of “fiction,” has edged a little too close to “the possible” for comfort? And one does some other stuff, too. But this-here blog is about the fiction writing. On that note, signing off — with a PS that yes, that next episode of AMERICUS is coming soon. 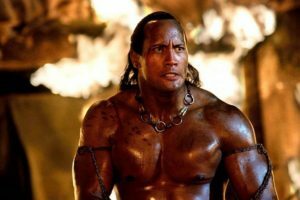 Thirteen more to follow, assuming no rebellion (among the characters, that is … yes, sometimes they ride roughshod over things like outline, arcs, and plans). 12:33 1/1/17 #amwriting Happy 2017, everyone!! Hope everyone’s 2017 is off to a great start. Love every one of you. For the time being, it seems I’m doing much better at sharing via the newsletter than sharing via the blog. So here you go … the holiday edition. Shiny-pretty goodies here; enjoy! Reading this? I’m feeling’ the love. 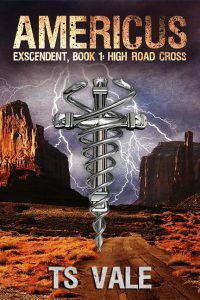 For those of you who like print … and yes I am one of us … AMERICUS • High Road Cross is now available in paperback. … the fact that I am currently a very minimalist blogger?